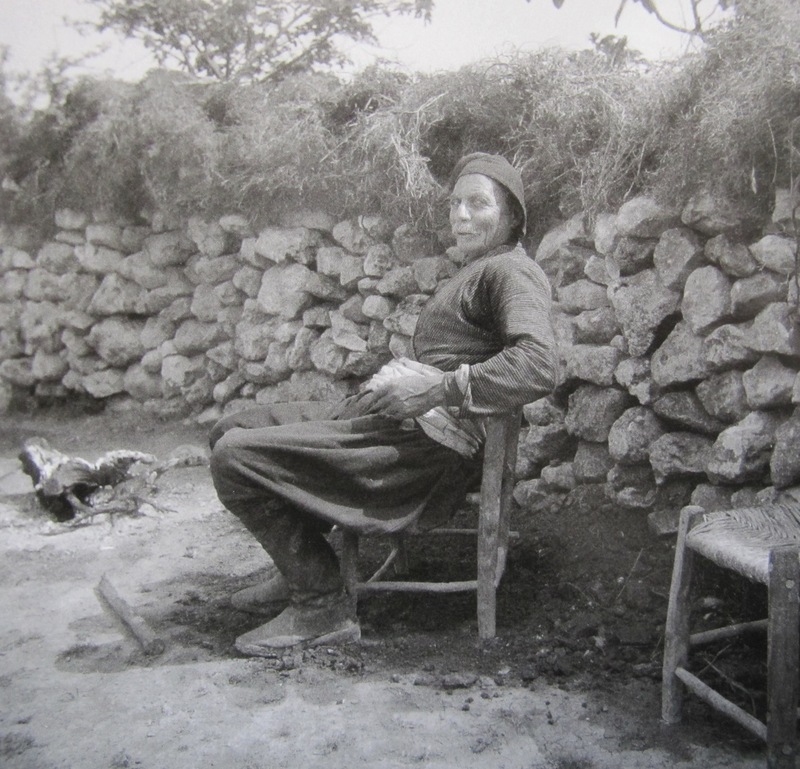 Note the stone wall behind the “Man at Geroskepou,” Paphos District circa 1940. Photo from “Faces and Places of Cyprus (1933-1956): Porphyrios Dikaios’ Photographs at the Department of Antiquities” (Nicosia, Cyprus 2012), 132.
over reproduced photographs in Faces and Places of Cyprus (1933-1956): Porphyrios Dikaios’ Photographs at the Department of Antiquities (Nicosia, Cyprus 2012). The stone wall within the 1940 photograph struck me, especially considering what my May 2012 team has been uncovering at our excavation unit on the Vigla site in Cyprus. After scraping away one centimeter of soil after another (along the way discovering a Scythian metal arrowhead, an inscribed lead sling bullet, and kilo after kilo of pottery), our group came to what appears to be a foundation wall. This is what the geophysics also suggested a year or two ago, which is one of the reasons our test unit was placed in the position it is in. Bring in the geophysics, and ground-truth with test units. Anyhow, without jumping to one definitive conclusion or another, while digging it is still important to imagine what buried piles of stones may have once been. A stone wall? A floor? It is equally important to swoop up local and regional publications while on an archaeological dig, no matter where the dig is situated on the planet. At the very least this keeps the imagined and creative juices flowing in the evenings, and these ideas can be brought to the field during troweling and sifting throughout the daytime heat (You can talk about this and follow it up by handing a crewmember a bottle of water that has been sitting in the afternoon sun and say, “Here is some warm water to cool off with…”). No doubt, the wall in the 1940 photograph is not the same as the possible wall from thousands of years ago. But there is such a thing as pre-Industrial continuity, at least in how folks back in the day constructed stuff using local materials and raw, human labor (one stone after another). Your crew just may appreciate these kinds of speculations. And if they can see a comparative example to imagine what the wall they may be digging may have looked like (yes, a perhaps and maybe), that is all the better. 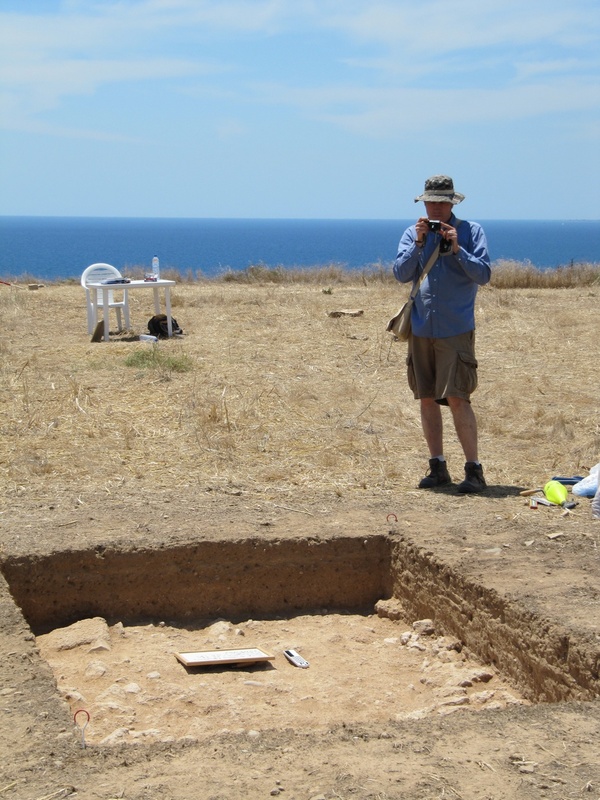 Dr. David Pettegrew photographs the stones emerging from the bottom of an excavation unit on the Vigla site in Cyprus, late-May, 2012. This entry was posted on Monday, May 28th, 2012 at 6:55 am	and posted in Uncategorized. You can follow any responses to this entry through the RSS 2.0 feed. Wow, so interesting as you uncover inch by inch during your archeology dig.